These are Mens Gaffer Long Sleeve Cotton T-Shirt in attractive & good looking colour. These are designed to give you a new smart, fashionable & gorgeous look in parties. These are made of Material: 100% Cotton. It is an elegant design with Long sleeve, Crew Neck, Suitable for casual, night & party wear. These Mens Gaffer Long Sleeve Cotton T-Shirt are available in different attractive colors which not only look decent, they feel fantastic as well. It is suitable for various indoor & outdoor activities. It is also good for casual use or you can give it as a Gift. 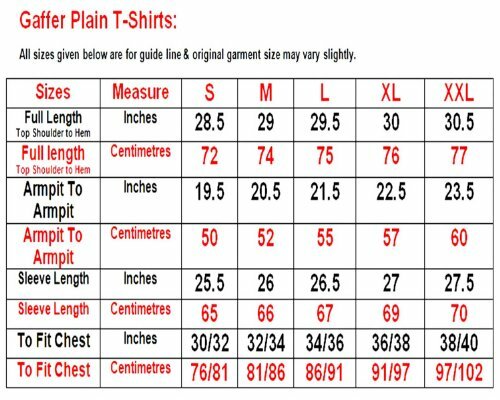 These Mens Gaffer Long Sleeve Cotton T-Shirt are cheap bargain offer from 5poundstuff.com where everything is available for 5 pounds only.